NOTICE: I am not an English speaker. Some phrases in this text may be incorrect or sound odd, but I think that this sort of article must reach the widest public: not many are interested in trying legacy lenses on modern, digital cameras, and if I were writing in Italian, the not-so-many would become a few ones! Following my other articles about some legacy lenses, and especially a few, cheap wide-angles, I am now completing the search for a portrait lens by inspecting performance at infinity focus. I am not super-careful when doing my tests, so there is always something that makes them imperfect. In this case, a couple of times I didn't focus properly (even if the shots per aperture were two) and I did not frame the same area every time, so I cannot always provide the same subject for the crops, but my conclusion are based on a global analysis and what I say may not be evident but it's there, in the full images that I can look at. 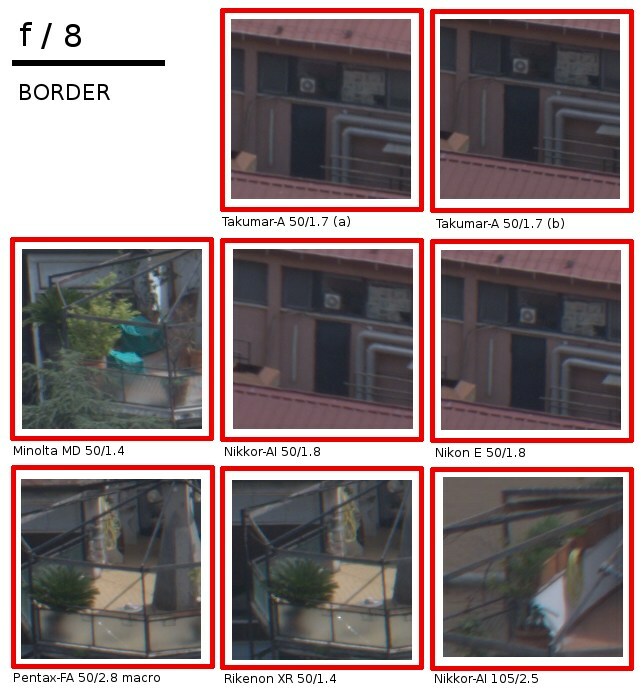 Put at work with the Fujifilm XT-20 APS-C sensor, all of these optics performed admirably, as expected, but indeed, there are differences! If I had to name a winner, I wouldn't hesitate: finger is pointed at the Minolta MD 50mm f/1.4. This lens is weak only at f/1.4, but already much better than the other f/1.4 competitor, the Ricoh Rikenon XR 50mm. It also improves fast and at f/2.8 the Minolta has no rivals, it's really in a class of its own, apart from one contender, the Pentax-FA macro 2.8, but the latter lacks the wide apertures and is not exactly a lens for the same purpose. Now that the crown has been put on the king's head, I must admit that in this case the "legendary" attribute is well-deserved by the MD optics. Obviously, closing the diaphragm beyond f/4 makes the outcome so good, for most of the equipment tested here, that you can't really say which one is better, though negligible differences remain. At f/1.4, the Rikenon is really a bad lens. 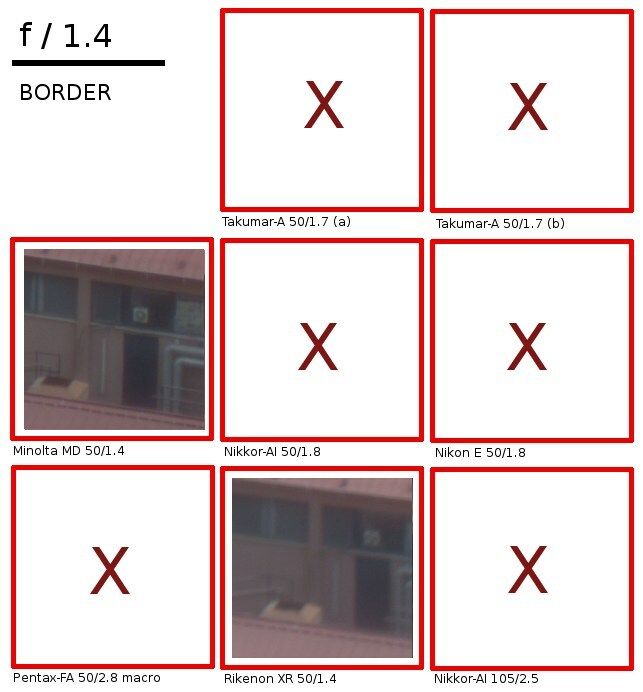 The picture is soft, even when scaled, and borders are ugly on the APS-C. The Minolta is better though still not much useable, unless you don't care about softness and you're shooting a portrait. 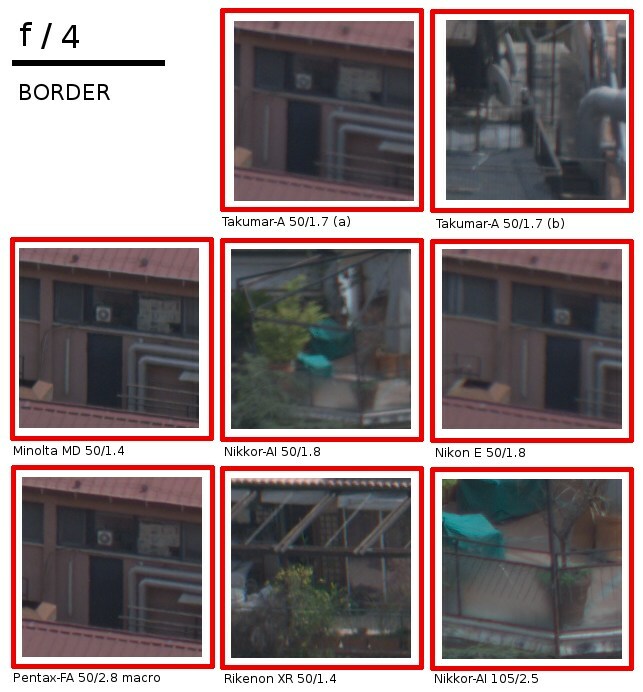 At f/1.7 and f/1.8, I present crops for the other lenses (except the Pentax-FA 50mm macro and the Nikkor 105) that cannot open f/1.4. Again, the widest aperture is of not much use though better than what we see at f/1.4 with the Minolta and the Rikenon; anyway, I've already expressed my preference for the Pentax line, but make no mistake: the Nikkor are not far and the Nikkor 50mm is probably minimally better in the center, but corners are more acceptable (or "less unacceptable") in the Pentax; you can see in the identical crops from one copy of the Pentax-A optics and the Nikkor 50 how better the former does. At f/2.8, the Minolta beats every opponent and this is very important for me because I consider this aperture a sort of break-point, where it usually becomes a bit easier to manually focus thanks to a bit more DOF (while under f/2, focus peaking is often not enough of help), still possible to isolate the subjects from the background and, on a good lens, to have an acceptable sharpness all over the APS-C sensor area. Not to mention the fact that, in my experience, the f/2.8 is the aperture I can still work in theatre under dim lights with a decent shutter speed, possibly 1/90th of a second. 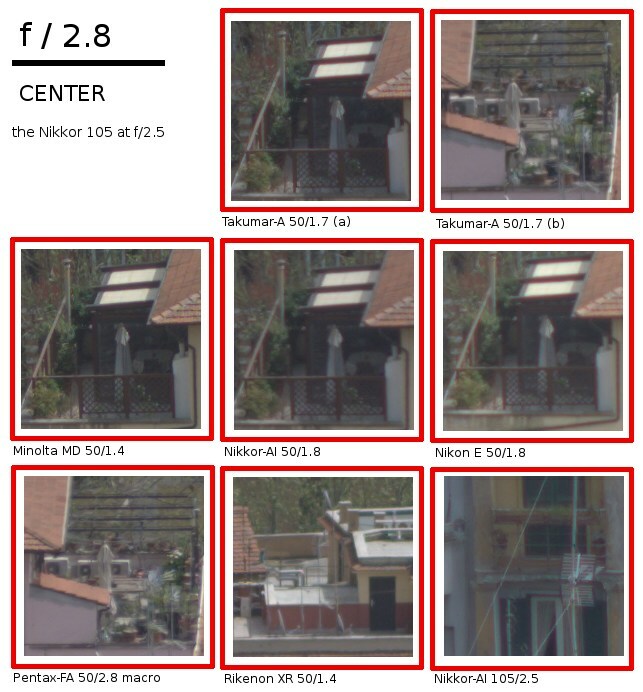 Well... if you look at the white roof from the crops of the older Pentax-A, the Nikkor's and the Minolta MD, you can see that only some show better details as the "horizontal" line dividing the roof itself, not just the "vertical" lines. Also the sharpness of the dark brown grid that encloses the balcony speaks for itself. Moving to the borders, that is where the Minolta really shines, destroying the competition; the only real survivor is, unsurprisingly, the renowed Pentax-FA 50mm macro, an excellent and rather rare lens I miracoulously bought in mint conditions a short time ago. I must say that the Rikenon does a good job, too, and I did not expect this as tests from a shorter distance were unconvincing. It's maybe a matter of [micro-]contrast, but where the Ricoh doesn't convince me is the general IQ. Probably with just a bit of software retouch it can deliver. 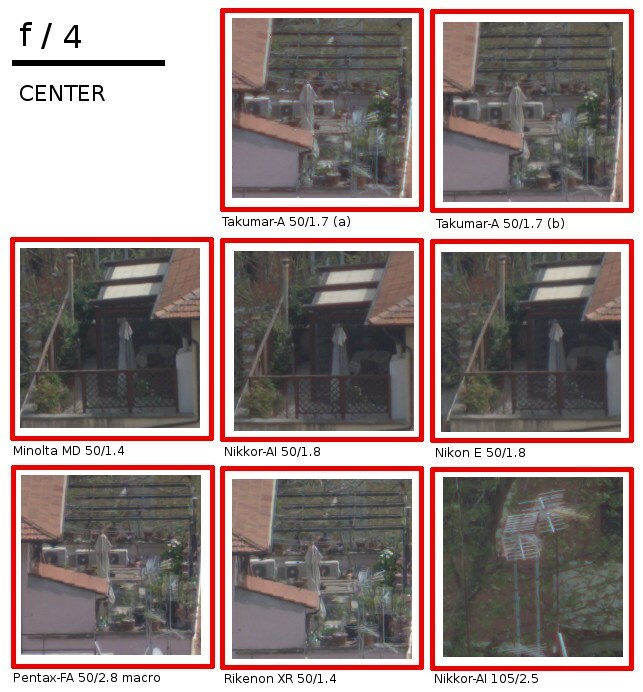 At f/4, all of the 50mm optics are quite good in the center, but the Minolta and the Pentax-FA retain the advantage at borders, though less pronounced. I must say that the Nikkor 105 is good but I expected more of it, especially since f/4. This lens appears to have corner performance almost on par with center performance, though, and this is a good thing. At f/5.6 I messed up with the Minolta shots, so I'm forced to present an unusual subject for the center, not suitable for comparison. You can see for yourself that the weaker lenses are catching up but the general impression is the same. At f/8, finally, I think that sharpness is decreasing a bit; especially in the center, I feel this is a generalized behaviour though the Nikkor seems to better resist the diffraction kicking in. In this case, I messed up with the Minolta shots, so I'm forced to present an unusual subject for the center, not suitable for comparison. 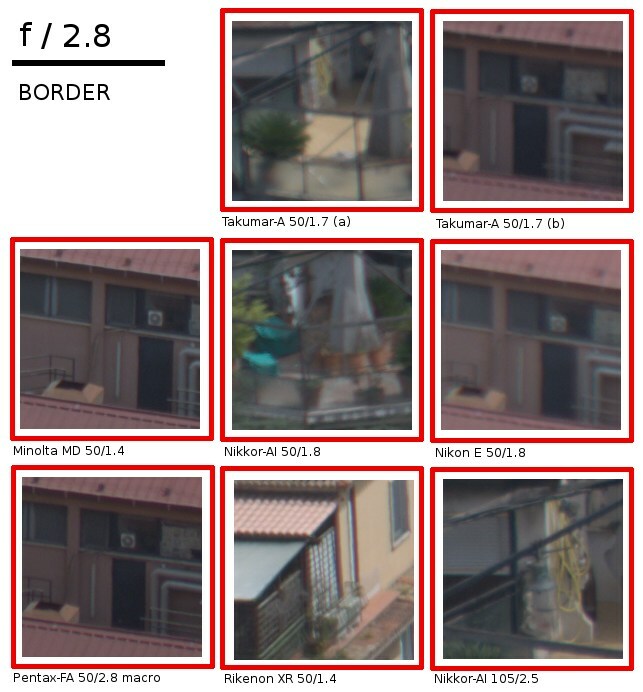 I should investigate this a bit better, but the Minolta MD and the Nikkor-AI 50mm seem to be able to focus a little beyond infinity. In some cases, this is a desireable feature, on the other side, it may be comfortable to know where you are (at infinity) at the end of the focus ring run. 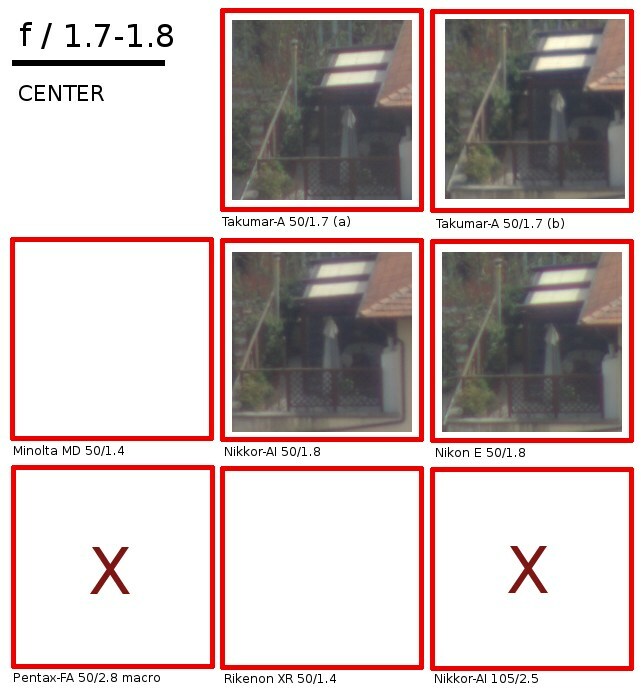 Focusing with these legacy lenses is generally pleasant, but I've already noted in the test at portrait-distance that there are differences. The Pentax-FA macro is the most peculiar case where you have to use the clutch control (smart! it is in the side of the lens) to obtain a firm movement, otherwise you must practically keep your hand holding the ring (but it's what the clutch is there for, right?!). The Nikkor 50 is a bit wear, that may explain why I often miss the feeling of firmness I desire. The Minolta MD is by far the heaviest normal 50mm of the group (I leave out the FA macro that is a special case), feels super-solid and I think it's all metal-built. 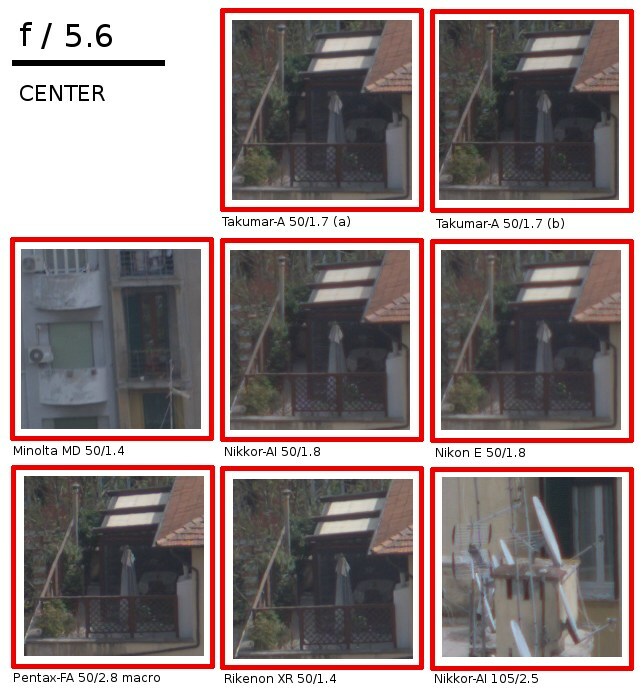 I cannot tell if there are more elements inside (that would explain why it has the best performance), anyway I found this information: 7 elements in 6 groups (here) where for the Nikkor-AI 50mm, for instance, the web says (6 elements in 5 groups). The Rikenon shows some very limited lateral CA, but really nothing to worry about. 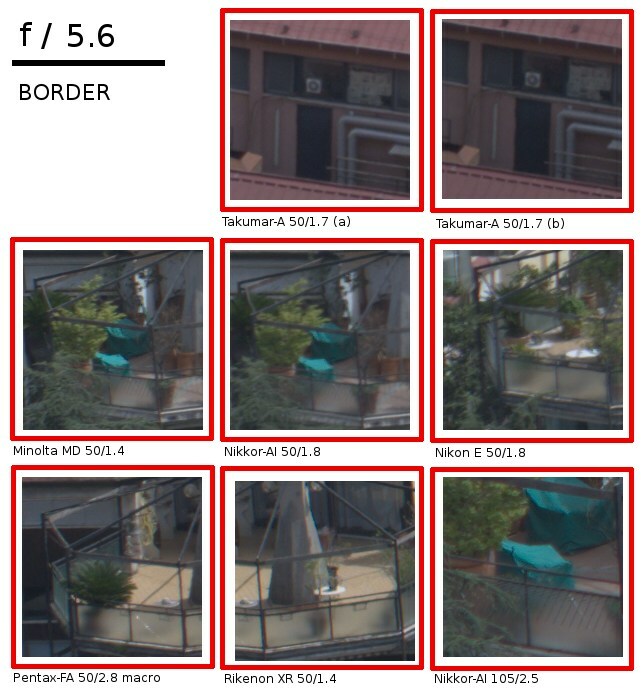 As expected from these focal lengths (50 and 105), the optic test reveal that aberrations are minimal or well controlled, at this distance also spherical aberration is irrelevant, it may just have played a little part at the maximum apertures. I explored distorsion in some other page of this site but it is, for the lenses that I had at the time, irrelevant (in the form of barrel distorsion, never pincushion), and I bet it is the same for the items in this group. Some lateral CA, is, indeed, present, but is not disturbing. The Nikkor-AI 105mm is rather heavy, more than I hoped, and handling is far from ideal with a small camera as the XT-20, somewhat the Pentax-M 135/3.5 is friendlier, but its narrower aperture obviously helps towards compactness. A larger body would be more appropriate for the Nikkor. 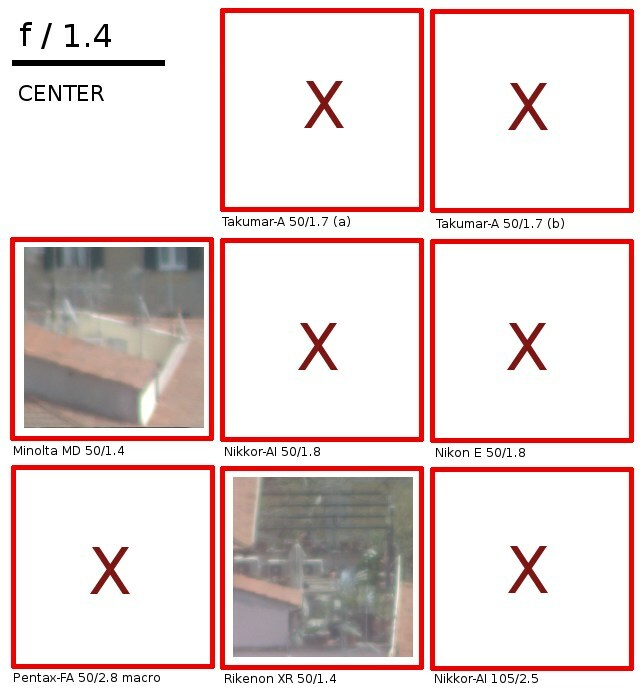 And, I'll never stop repeating this, remember that these tests are performed with an APS-C sensor, so the actual corners of the lens field are cut out of the image. Some lenses may prove better or worse if tested on a full-frame camera, because of the borders, yet I'm currently married to my APSC equipment and I plan to remain faithful for some time (or... until Pentax releases a compact, mirrorless full-frame camera!). 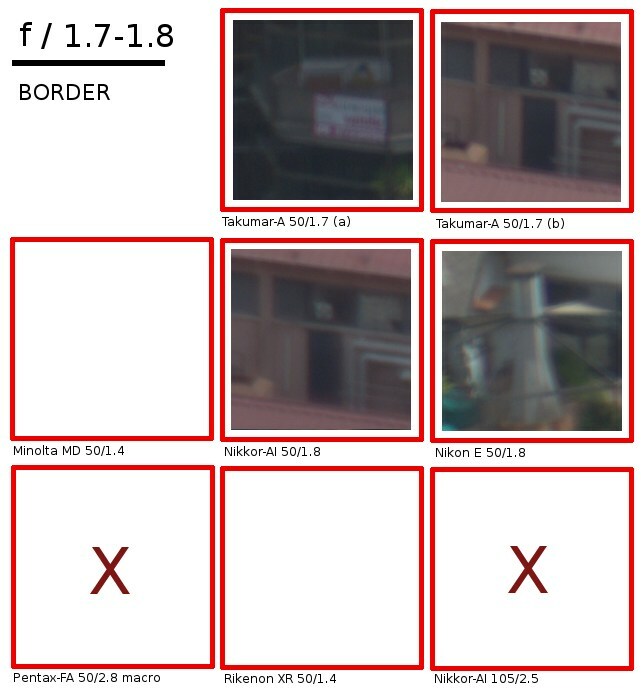 The images contain 100% crops from the photos. 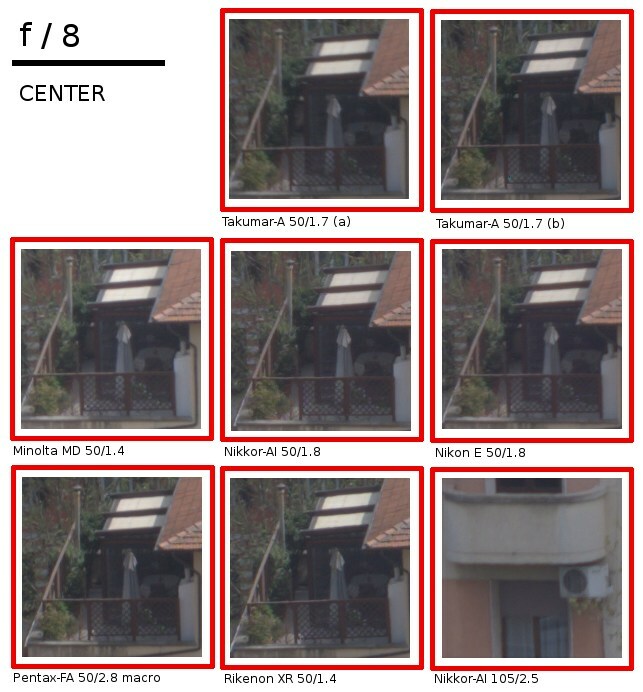 All lenses has been tested twice for each aperture (refocusing each time). So, for each aperture, I picked the best crop for the center and the border. *** I HAVE USED THE TERM "Takumar-A" INSTEAD OF "Pentax-A"
Do you love Italy? Check my little site, I hope to find the time to make it grow!